Just Listed in the sophisticated seaside city of Boca Raton within the full-service condominium community of Mizner Tower is this impeccably maintained turn-key furnished condo. Tucked away on the 7th floor, this masterfully crafted 3BR/4.5BA Mizner Tower penthouse captures a panorama of stunning ocean, Lake Boca and Intracoastal views throughout its 2,660 square feet of living space. In addition to spectacular views, this Boca Raton beauty offers a number of premium features including marble flooring, 9’ ceilings, a generous gourmet kitchen with stainless steel appliances and granite countertops, a spacious Master Suite with walk-in closet, one garage parking space and a generous covered balcony accessible from nearly every room. 300 Se 5th Avenue #7110 is located in Boca Raton and is currently asking $1,299,000. 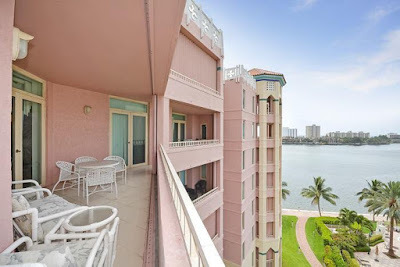 This Mizner Tower listing is courtesy of Douglas Elliman MLS# RX-10142918. Mizner Tower is an 8-story condominium building uniquely situated within Mizner Village right on the grounds of The Boca Raton Resort and Beach Club. Residents of this exclusive pet-friendly community enjoy an impressive 5-star amenity package including 24/7 security, concierge service, valet parking, clubhouse, community room, card room, a waterfront pool with staffed bar, two outdoor spas, a steam room and sauna, jogging paths, putting green, tennis courts and two fully equipped fitness centers. Boat dockage and Boca Raton Resort and Beach Club membership options are also available to residents. Mizner Tower also offers a premier address with close proximity to the high end shopping, sophisticated dining and miles of pristine Boca Raton beaches.